Our guest today is Don Tate, a children’s author and illustrator and onetime strongman (keep reading — you’ll see) living in Austin, TX. He teamed up with fellow Austinite Chris Barton as the illustrator of The Amazing Age of John Roy Lynch. In this special edition of Five Questions for Black History Month, Don was gracious enough to answer a literal score of questions about his new book, his influences from Black History, his craft, and the past and future of his own story. What figures or moments in Black History have shaped and inspired you? The election of Barack Obama to the U.S. Presidency inspired me deeply. I fought off tears every time I watched candidate Obama give a speech or participate in a debate. The tears flowed when he was elected to be president — both times. I didn’t believe that a black man could be elected to be president of the United States; I don’t think any black man or black person believed that. Can you imagine how many young black minds were corrupted by that notion? His election changed me. I’m stronger, more self-assured. I can now stand in front of an audience of 800 people and confidently deliver a keynote presentation by thinking about President Obama. What is your goal when writing and illustrating stories from Black History such as The Amazing Age of John Roy Lynch? Telling the truth. I owe it to my ancestors to be honest and truthful when telling their stories. What is the unique legacy of John Roy Lynch in Black History? During Reconstruction it was deadly for an African-American to even try to exercise their right to vote. Black politicians were often dragged from their homes in the middle of the night and beaten or lynched. But that did not stop this black man — John Roy Lynch — from becoming Speaker of the House of Representatives — in Mississippi nonetheless! I think that John Roy Lynch’s legacy is similar to that of Barack Obama, who taught generations of black children that yes, you can! The problem is that most children don’t know about Lynch’s story. I hope that our book will change all that. What’s something not enough people know about John Roy Lynch? That his work with civil rights and social equality helped lay the groundwork for the 1960s Civil Rights Movement that we so often honor and celebrate. We can’t forget about civil rights trailblazers like Lynch. What’s something not enough people know about the Reconstruction Era in the South? Many people do not know about the Reconstruction Era at all. I certainly didn’t know much about it before illustrating this book. It’s a difficult and controversial subject to broach with children, and so I think most people don’t. What challenges did you face in illustrating The Amazing Age of John Roy Lynch? Reconstruction has been described as the reenslavement of African-American people but under new laws. It was not a pretty time in American history. The challenge was in portraying the truth about this history to young readers without giving them nightmares. 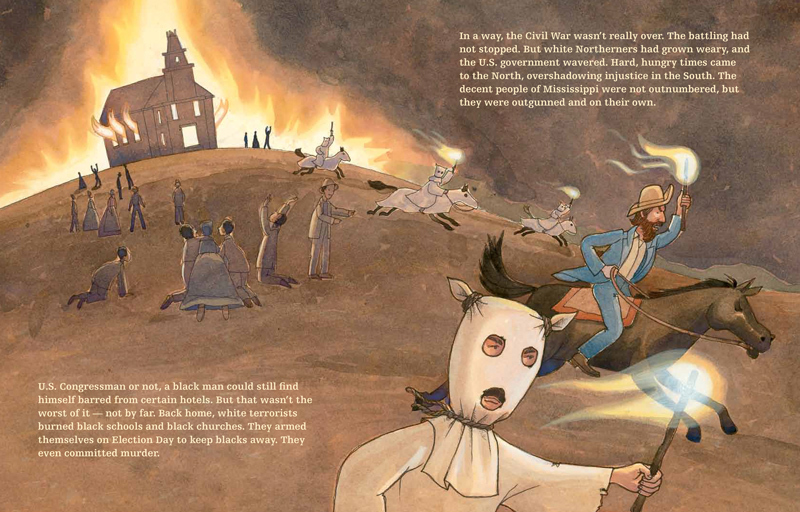 My own 11-year-old son cried when I shared some of the research materials with him; super-realistic paintings of whippings and church burnings would not work for very young readers. And so as much as some people might have preferred a more realistic approach, I decided to meet the challenge by using a softer illustration style. What makes The Amazing Age of John Roy Lynch a unique book? I can only think of a few books that are set in the Reconstruction years — and those books do not deal with the horrors of the Reconstruction years. While it was not our goal to focus on those horrors, they had to be included in the story in order for the reader to fully understand how “amazing” John Roy Lynch’s accomplishments really were. How did your collaboration with Chris Barton materialize, and what’s your process for working together? Chris Barton and I were manuscript critique partners at the time. We’d get together once a month and review each other’s works in progress, so I read his John Roy Lynch manuscript early on. My first reaction was likely one of pause. Frequently, aspiring authors who are African-American contact me with questions about how to get their stories about African-Americans published. Most of their manuscripts face rejection and go unpublished, while white authors seem to have no problem getting stories about black historical figures published. That was in the back of my mind, yes. But that’s a big industry problem that I could not really address by myself. In the meantime, I had a wonderful manuscript in my hands written by someone who I knew personally, liked and respected. Chris Barton is a wonderful person, a huge advocate for social justice of all kinds (and, by the way, the inspiration behind the Modern First Library initiative, whose goal is to pair classic picture books with other favorites that reflect our diverse, global society). The initial pause melted away. I was fully on board with telling this story with this author. One day a few years later as I walked into the exhibit hall at the Texas Librarian Association conference, an art director at Eerdmans Publishing approached me about the possibility of illustrating The Amazing Age of John Roy Lynch, saying that it was Chris’s idea. I was so flattered that Chris would want me to bring this story to life. When it came to creating the book however, Chris and I really didn’t work together closely. We respected the publishing tradition of author and illustrator working independently. I did call on him more than a few times with questions and for clarification, and he shared all of his reference books with me, which helped greatly. I just returned from the American Library Association conference where Kwame Alexander won the Newbery. I just began reading his The Crossover. The last book I read was Jacqueline Woodson’s Brown Girl Dreaming. Which book has done the most to make you who you are today? Richard Wright’s Black Boy and Native Son made me a reader that I am today. 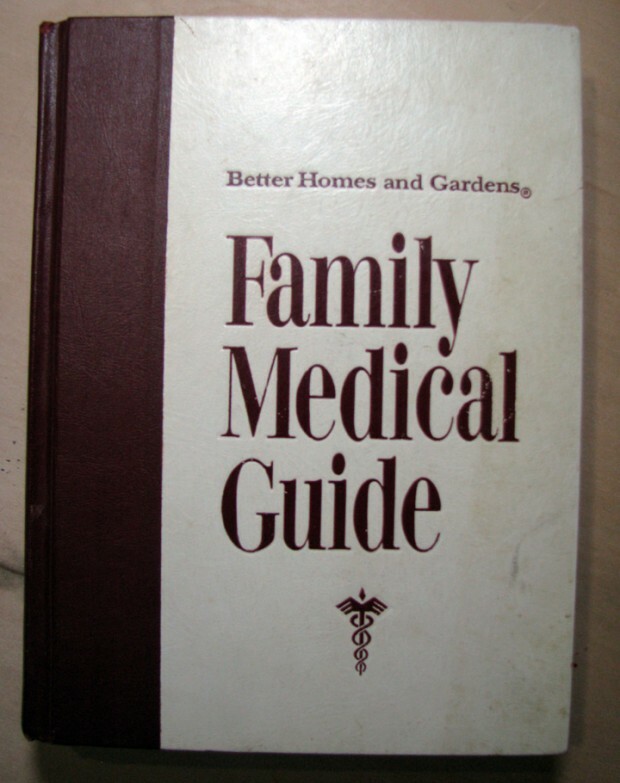 My family’s Better Homes and Gardens Illustrated Medical Encyclopedia — really! My grandmother had a lot of nursery rhymes collections around the house. I enjoyed reading those, too. Which book(s) would you/did you/will you make a point of reading to your own children? I will always remember reading Chugga-Chugga Choo-Choo by Kevin Lewis and Daniel Kirk to my son. We’d read that book and make the chugga-chugga noise, and it was just as much fun for me as it was for him. He is now 13 years old and last summer I introduced him to Sherman Alexie’s The Absolutely True Diary of a Part-time Indian. And he recently turned me on to Maze Runner, which is now on my reading list. Imagine you’re at the book talk of your dreams. Who’s the author or illustrator? What’s the book? And who are the people sitting next to you scribbling witty notes on their programs? I think I will have this exact opportunity this summer when Dan Santat, the recent Caldecott winner, speaks at SCBWI in Los Angeles. I will be there as a blogger, but I will be just as much a participant, along with many other illustrators. How did you get your start illustrating children’s books? I took a job right out of college at an educational publishing company in Des Moines, Iowa. I was a graphic artist (or publication designer), but my strongest skill was with illustration. I soon became an in-house illustrator. Soon my illustration work was in demand at publishing houses across the country, so I decided to leave that job so I could accept more work. My first trade book came along many years later with Say Hey, The Song of Willie Mays (Hyperion, 2000). I had a brief stint with natural bodybuilding. I won two trophies, too! I wrote a book on the subject, which comes out in a few years. What are you doing when you’re not writing or illustrating (or answering questions for Eerdlings)? Honestly, these days I just work. I need to find other things to do. Life’s too short. What’s the best advice you can give to aspiring authors or illustrators? Read a lot. Write a lot. Join a critique group. And join the Society of Children’s Book Writers and Illustrators (SCBWI) or other writing groups where you can find mentors. I wrote and illustrated a book called Poet: The Remarkable Story of George Moses Horton (Peachtree, Sept. 2015). It’s the story of an enslaved poet who became the first African American to publish a book in the south. And he published protesting his enslavement. Purple. But not just any purple. Light purplish blue. 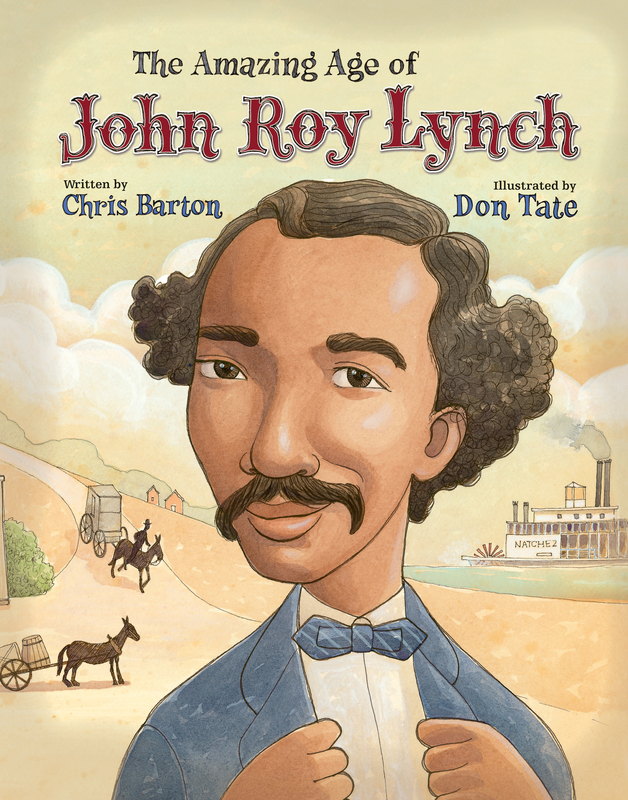 Keep up with Don Tate on his website (www.DonTate.com) and on Twitter (@Devas_T), and click here to order The Amazing Age of John Roy Lynch.